A LOGAN City woman is returning to her ancestral city of Hiroshima to give thanks for a twist of fate that spared her from being a victim of the atomic bomb that fell on the Japanese city during World War II. 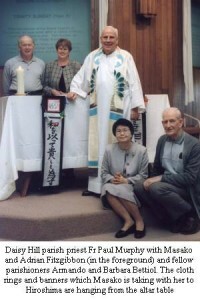 Daisy Hill parishioner Masako Fitzgibbon left on June 22 for Hiroshima with a series of cloth rings wrapped around banners in Japanese and English, and a wooden segment from the end of her parish’s Jubilee Year staff. She will lay the cloth rings in the memorial to atom bomb victims in Hiroshima when she prays there. Parish priest Fr Paul Murphy said the highly symbolic rings would be the parish’s offering of solidarity with the city and with its Catholics. In Hiroshima, Mrs Fitzgibbon will embark on a pilgrimage to the graves of her parents and ancestors. Then she will visit the Peace Memorial Park on the anniversary of the death of an elder brother. Her family was in Korea during the war and towards the end were to be repatriated back to their home in Hiroshima. But her brother became ill with scarlet fever and died when he was nine years old. Because this delayed the family’s return, the family were not in Hiroshima when the bomb dropped. Masako said her brother’s death had saved the whole family and she consequently had great empathy with all those who died in the bombing. She said that she would bow her head in prayer at the memorial, praying that people’s everyday efforts for peace and harmony would ensure that their deaths were not in vain.